Type PP Air Filters - Airsan Corp.
Airsan Type PP filters are medium-duty filters designed for engines, compressors and a variety of other industrial applications with higher particulate filtration needs, such as locomotives and maritime vessels. Built to last with durable 18-gauge frames and heavy-duty paper media, these filters are available in a wide variety of standard sizes. 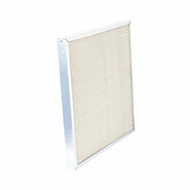 Airsan can also custom-design filters to meet your own unique specifications and requirements. AIRSAN TYPE PP FILTERS ARE MEDIUM DUTY FILTERS DESIGNED FOR ENGINES, COMPRESSORS AND A VARIETY OF OTHER INDUSTRIAL APPLICATIONS WITH HIGHER PARTICULATE FILTRATION NEEDS, SUCH AS LOCOMOTIVES AND MARITIME VESSELS. BUILT TO LAST WITH DURABLE 18-GAUGE FRAMES AND HEAVY DUTY PAPER MEDIA, TYPE PP FILTERS ARE AVAILABLE IN A WIDE VARIETY OF STANDARD SIZES. AIRSAN CAN ALSO CUSTOM DESIGN FILTERS TO MEET YOUR OWN UNIQUE SPECIFICATIONS AND REQUIREMENTS.